When Holbein painted this image in 1536, it was virtually unknown in England for anyone other than courtiers to be recorded in a portrait. Until then portraiture had been a part of the funeral traditions of the powerful rather than a celebration of more modest lives. This beautiful miniature, however, shows that almost from the moment of its invention the portrait miniature was not exclusively a court art. A coat of arms, painted on a piece of vellum long associated with this portrait and set in the lid, identifies the sitter as ‘Mrs Pemberton’. This identification had always been something of a puzzle, since Mrs Pemberton appeared to be the wife of an obscure country gentleman living in a Northamptonshire village, far from both the court and Holbein’s practice in London. Recently, however, the evidence has been reinterpreted, and the more likely explanation is that the sitter was Mrs Jane Small, whose maiden name was Pemberton. Jane was the wife of a prosperous London merchant, Nicholas Small, and they were close neighbours of Holbein. It is not known if she was painted for a particular occasion, or why she is shown wearing a red flower and two ears of corn and holding a leaf. 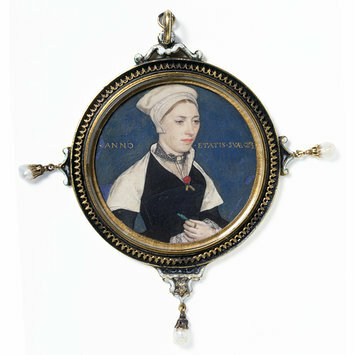 Portrait miniature of Mrs Jane Small, formerly Mrs Pemberton, watercolour on vellum in a decorated case, by Hans Holbein, ca. 1536. Foister, Susan, with contributions by Tim Batchelor Holbein in England Tate Publishing, 2006. ISBN: 1 85437 645 4. Strong, Roy. Artists of the Tudor Court: the Portrait Miniature Rediscovered 1520-1620.. London: The Victoria and Albert Museum, 1983. Marks, Richard and Paul Williamson, eds. Gothic: Art for England, 1400-1547. London: V&A Publications, 2003. 496 p. : ill. 1851774017 (hbk.) 1851774025 (pbk.). Jane Small was the wife of a London cloth Merchant. Her social status is reflected in her relatively simple costume. The red carnation at her bosom is perhaps a reference to her betrothal. This probably took place around 1540 and may have been marked by this portrait.